Before my sister-in-law’s visit a couple months ago, I had no idea what geocaching was. Do we need a map? What are we “caching” exactly? But her description both intrigued and amused me: Geocaching is the perfect blend of nature and nerdiness. Widely described as a high-tech outdoor treasure hunt, geocaching involves using a smartphone or GPS device and searching outdoors for hidden “caches”. 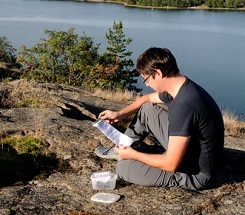 Caches are containers with trinkets inside, as well as a logbook listing who found the geocache and when they found it. The rules are that after you find a geocache, you must place it back exactly where and how you found it, and if you take any of the trinkets, you must leave an equal number of your own trinkets. Geocaches are hidden by other geocachers who record the coordinates using their GPS devices and post the coordinates online. Then it’s up to other geocachers to find them, using their own technology devices, thought processes and persistence. Geocaching.com states that there are actually 1,969,777 active geocaches and over 5 million geocachers worldwide. With that number of geocaches all over the world, it’s more than likely you have at least one geocache somewhere nearby. On our first outing, we used a smartphone and a geocaching app. We were equipped with a pen to log our name (create a fun geocache code name with your kids) and the date, as well as trinkets to leave behind. My youngest daughter also brought a notebook to record all our finds, tweezers if the container contents are very small and a flashlight for harder-to-find geocaches. We found that there were many geocaches nearby – in parks, along neighborhood streets, in grass fields and more. The phone app gave us not only the coordinates of where the geocaches could be found but also gave hints in the form of riddles or puns. I was the lucky one to find our first – it was in the form of an artificial little tree stump container, hidden among some similar-looking branches in a bush. We found a variety of trinkets — everything from small Slinkys to little bottles of hand sanitizers. After finding my first geocache, I have to say I was hooked. It’s thrilling for kids and adults alike to not only discover it after putting together the coordinates and hint info, but also to see what’s inside the containers and check the log for when it was first discovered. It was also interesting to find that there were some geocaches hidden in places we pass by regularly, with no idea they’ve been there for years. After the geocaching excursion is done, your kids can go to geocaching.com and write in the log to let the owner know you found it. They can include details (but no “spoilers” that tell exactly where it can be found), such as the condition of the cache and your experiences on the trail. Using our smartphone geocache app, we were able to log and write this info into the app itself. Like other activities you do with your kids, make sure that the level of the activity is age-appropriate. The geocaching “addiction” doesn’t really set in until you start finding the geocaches. If you don’t find any at all, your child may likely become frustrated and disinterested. There is a range of difficulty as far as how hidden geocaches are; for us, some were easy to find and some seemed impossible. The difficulty level and roughness of the terrain are rated online. When starting out, it may be best just to start in your surrounding area and use the easiest difficulty level. In addition to the pure fun factor of geocaching, it’s also a great family activity. You are all getting outdoors — possibly to areas you’ve never checked out before, possibly hiking around and working together as a team. The activity also perfectly marries nature with technology. Geocaching also can teach respect, as you must abide by understood “ethics”, such as hiding the geocache just as you found it and leaving something behind if you take something. These rules are crucial, as they allow many others to enjoy finding geocaches after you already have. One of the biggest pluses to geocaching is how it encourages kids to be patient and active at the same time. Some geocaches we eventually found were a matter of not only patiently searching in a particular outdoor area, but also using our heads to go over and over the GPS coordinates and hints in our heads. For example, what exactly does “you’ll find the cache where the light bends” means? To be honest, we still haven’t found that one. But we’re not giving up and will head out there again and again until we find it.